Kelly's has been recently refurbished to a high standard, suring a comfortable and moderately priced stay in Dublin's city centre. Kelly's is one of the last family-friendly run s in the city and is ideally placed to offer easy access to all of Dublin's attractions - everything is at your fingertips. We have inexpensive accommodation, smartly finished rooms, full bar facilities and we are closely located to Dublin's city centre. Our is surrounded by restaurants and bars. A 2-minute walk from Grafton Street, Dublin's premier pedestrian shopping boulevard; a 2-minute walk from the Temple Bar area, Dublin's number 1 tertainment centre; a 10-minute walk from O'Connell Street, Dublin's main thoroughfare. We invite guests to joy a pint of Guinness in our first floor bar, whilst overlooking the busy scenes of South Great St. Georges Street below. Or pay a visit to Georges Street Arcade, located 5 doors from the , offering a wide fare of Celtic jewellery, original knitwear, intimate cafes and fresh food stores. 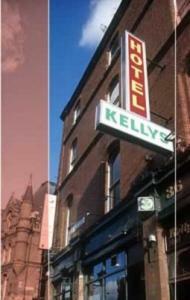 A stay at Kelly's will always be a memorable one, offering value for money in the heart of Dublin. You are insured of the lowest internet-rates. But you can pay at the reception of Kellys Hotel, Dublin. Without reservation costs and at the lowest price! After your reservation you receive a conformation by e-mail. We wish you a pleasant stay at our hotel in Dublin. All hotels within Dublin: Click here.